Many of our accounting and finance students take an extended work placement as part of their sandwich degree to enrich their CVs and first-hand experience of the workplace. 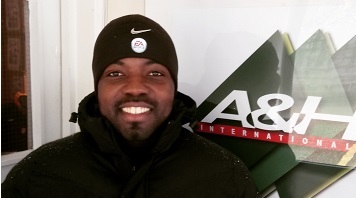 Jamaal was one such student, taking on a challenging (but rewarding) internship with Surrey’s A&H International – a specialist supplier of kit and equipment for sports referees. “June and July is the busiest time of year for the business, and there was also a release of the latest edition of the business’s highest-selling product. As a result, I spent the majority of my first two months working in the operations and shipping part of the business to ensure customers received their orders quickly and for the lowest shipping costs as possible. With Jamaal’s honeymoon period over, he started to enjoy understanding how the company works. He began to have input and use business and economic theories to improve the business’s performance. The business had been in a monopolistic position within the market for over a decade but was now coming under increased competition. Jamaal identified that a large portion of stock was purchased by the business at very low cost. As a current customer of the business, he had an understanding of the market value of the products and was confident of the prices that customers would be willing to pay while undercutting the competition. With the Christmas rush in full effect Jamaal quickly had to understand the importance of this time of year for A&H International customers. Usually, errors could quickly be sorted out by ensuring products are returned and then the correct order sent back to the customer. But, if the order is a Christmas gift it changes things massively. “After 15 December, our boss made it clear that productivity needed to be at a maximum and there could not be any errors. After a few errors were made, which caused some conflict and unrest within the office, I suggested that a provision for errors account should be created as an expense to the business. This had never been done before in the business. “By this time I was given bank reconciliation as a role as well as fraud checking and releasing customer payments on SagePay. Despite doing other roles and being productive, getting down to some financial work reminded me of how naturally it comes to me. Due to staff movement, these extra roles forced me to manage time even more effectively, while my organisational skills needed to be at maximum. As a result of Jamaal’s suggestions, changes were made. With a previously outsourced social media manager moving on, Jamaal volunteered to help out and mentioned that it would reduce expenses. As a result, he became the social media manager of the company. “I wanted to make our business more competitive by offering more sales promotions, price reductions and videos that will interest our customers. Our boss, however, did not want me to do a wide-scale price reduction because he felt it would impact on our margins. What I then did was a cost volume profit analysis on our lower-performing products, and convinced him it was something we should try. Using the CVP, I discovered that we could sell one of our products for up to 40% less and still meet our profit target. I did a sales promotion on that product to prove to the boss the effect that CVP could have.